I like to keep things simple, but I also like to make things that are a little unusual. To go with my Valve Amplifier, I wanted to make a simple radio tuner. Where I live, there is a powerful FM transmitter almost in my back yard. It is very strong and overpowers all other transmissions, so the only FM station that I can receive is Abu Dhabi Classic. That gets rather trying after a while, but why not turn it into an advantage? Since the radio transmission is very strong, it can be detected with a simple tuned circuit and a non-linear element - there is no need for a complex discriminator or PLL. For an intuitive explanation of how it is possible to demodulate FM with an AM detector: If you tune an AM receiver adjacent to an FM signal, then when the FM signal is closer, the AM signal will be stronger and when it dithers further away, the AM signal will be weaker - that way, a simple envelope detector can detect a FM signal. Some call this a slope detector. Crystal sets are normally associated with shortwave radio, which require enormous coils, air capacitors and high impedance headphones. In the 100 MHz FM band (88 to 108MHz), everything is much smaller, but a high impedance headphone may still be a problem to find. 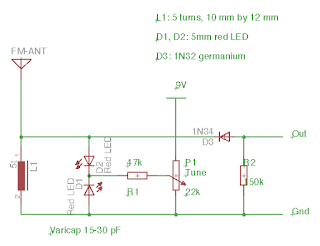 Piezo electric speakers are commonly used in laptop computers and can be obtained from Digikey or Mouser, so you can use one of those, but do put a resistor in parallel, since it won't pass DC. Mike's actually has everything you may need. Variable capacitors are somewhat hard to get and air capacitors are still manufactured by at least one US company, but are expensive. 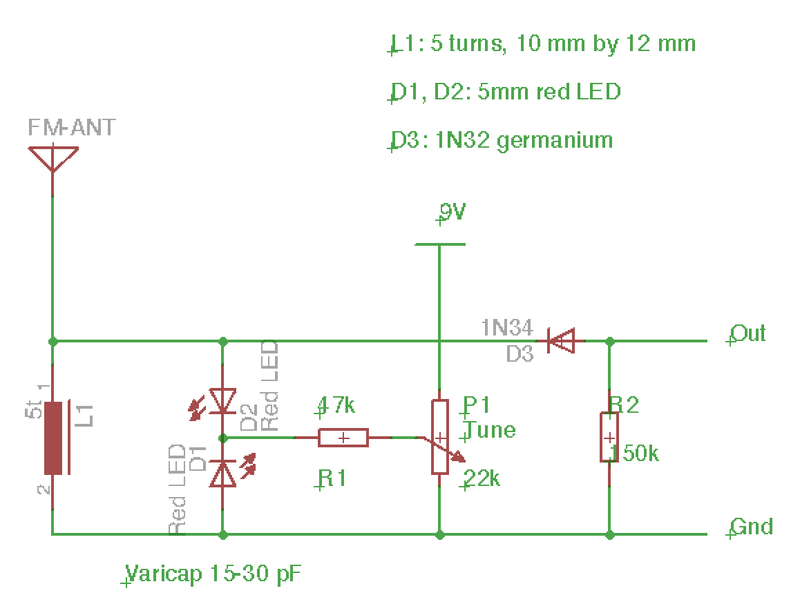 Using varicap diodes to tune a circuit is also expensive, but LEDs and zeners are cheap and make fairly decent DIY varicaps. This circuit looks like a FM crystal radio with a 9V battery. The battery is needed to charge the tuning capacitor, which is made from two red LEDs, used as varicap diodes. Red LEDS provide about 10 to 30 pF capacitance with 9V bias (You have to take a handful of LEDS and try them - some patience required). Other options are large rectifier or zener diodes, but a couple of 5mm LEDS look nicer. Of course a real varactor will be better and more linear, but who has a varactor in his junk box? If you want something a bit more predictable than a LED, then you could use 1N4001 rectifier diodes. 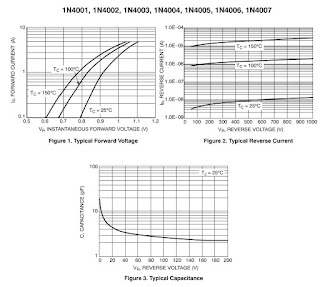 The 1N4001..7 all exhibit the same curve, as shown in the data sheet here on page 2. 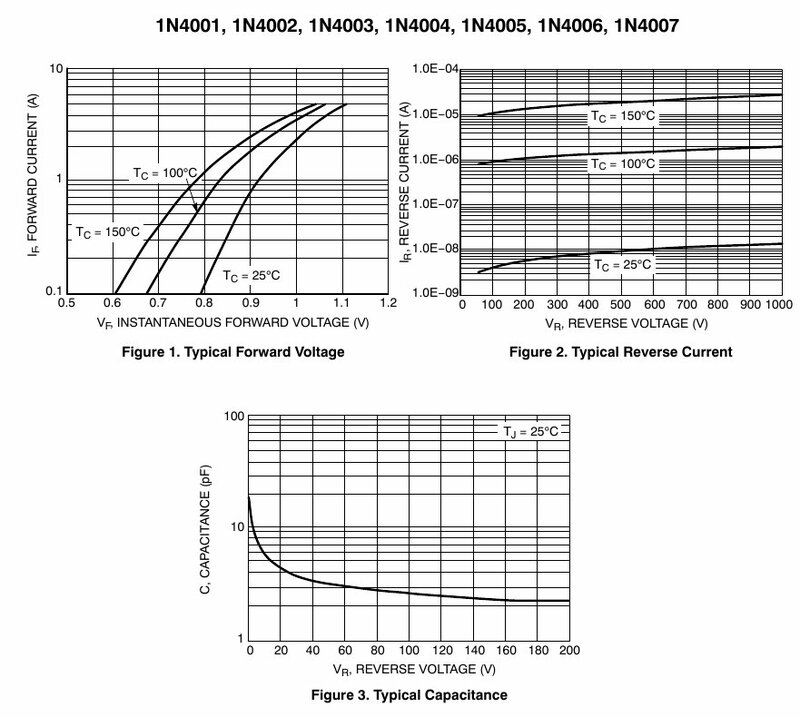 However, you would have to double them up to get sufficient capacitance. To make a 100MHz RF circuit work, it is important to keep all wires short (just a few millimeters) and the parts very close together, otherwise stray capacitance and inductance will detune it and it won't work as intended. The result is a FM crystal radio that can be tuned with a potentiometer. BTW, a 1/4 wave antenna needs to be 75 cm in length and a 1/20 wave antenna needs to be 15 cm. On a receiver, a bad antenna affects both the signal and the noise, so the S/N ratio stays the same, but a longer antenna will certainly catch more signal. If you solder the antenna on the top end of the coil, then it will load the coil and you won't be able to tune to the high end of the band, so solder it to the first turn from the bottom. So, how weird is that?